One of the Good Design Principles. Balance in art is a feeling of equality in weight, attention, or attraction of the various elements within a composition as a means of accomplishing unity. Read more. An art movement of the 19th century formed by a group of French landscape painters who sought to promote a more realistic and informal approach in their nature paintings. They were heavily influenced by 17th-century Dutch genre painting and proponents of outdoor painting. An art movement of the 17th and 18th centuries Europe whose artworks, music and architecture were characterized by exaggerated ornate detail. The style, which was popular with and supported by the Catholic Church, began around 1600 in Rome, Italy and spread throughout most of Europe. Seeing from a point of view that is from an altitude or from a distance; a comprehensive view in a downward direction; also called an “aerial view”. A pixel-based image (.BMP) with one bit of color information per pixel, also known as a bitmapped image. The only colors displayed in a bitmapped image are black and white. Its quality decreases when the image is enlarged. A high quality heavy weight drawing paper, sometimes made with cotton fiber prepared or glued together, usually with a caliper thickness of 0.006″ and up, used for many types of two-dimensional artwork, including lettering. Refers to a brush that has the same shape as a “flat” however the hairs are not as long as those on the flat brush. (See illustration). A tool used to apply paints and inks to a surface, consisting of hairs, or bristles held in place by a ferrule attached to a handle. The quality of the hair determines the brush’s quality and cost. 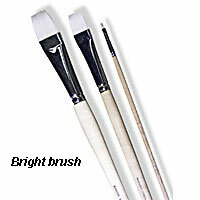 Each type of brush has a specific purpose, and different fibers are used for different mediums. The mark left by a loaded (filled) brush on a surface. Brushstrokes can be distinguished by their direction, thickness, TEXTURE, and quality. Some artists purposefully obscure individual brushstrokes to achieve a smooth surface. Other artists make their brushstrokes obvious to reveal the process of painting or to express movement or emotion. The distinctive technique in which an artist uses to apply paint with a brush onto a medium, such as canvas.